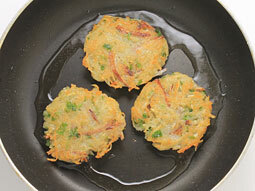 The traditional potato pancakes made from grated potatoes and onion has much more appealing texture both inside and outside. 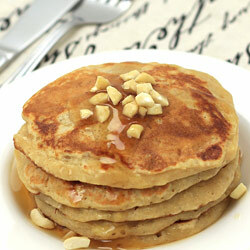 Making best homemade pancakes from potatoes call for using starchy potatoes. 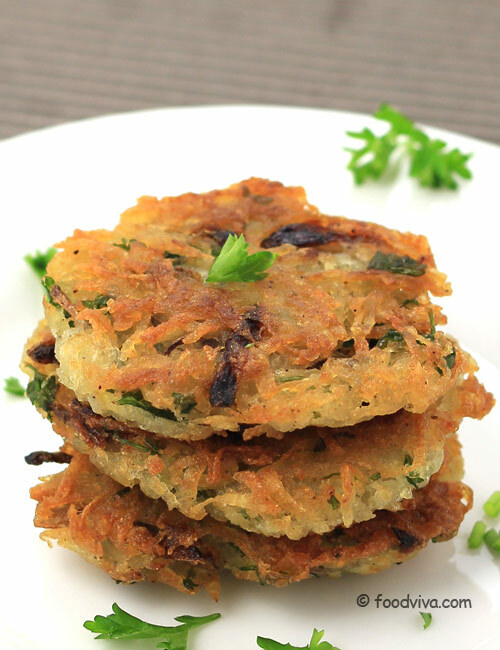 This recipe uses grated russet potatoes (or yukon gold potatoes) and onion along with parsley and all purpose flour to get the desired crisp taste and texture. Peel and grate potato using a large grater. 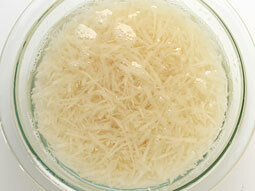 Place grated potatoes in a bowl filled with water to prevent them from turning brown. 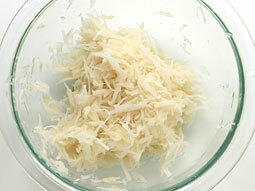 Wash the grated potatoes for 3-4 times using water. 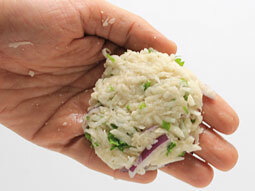 Drain excess water by squeezing them out. Alternatively, either use cheese cloth and wring to extract as much moisture as possible or place them in a strainer and press with a large spoon to remove excess liquid. 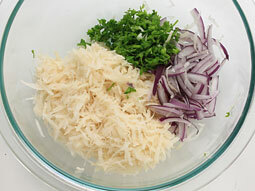 Add grated potato, finely sliced onion and parsley in a bowl. Mix well and add all purpose flour, black pepper powder and salt. Heat a heavy based small skillet over medium flame. Add 2-3 tablespoons oil (add few tablespoons more or less depending on the size of a pan, it should cover the bottom surface). Divide the mixture into 6-7 equal portions. You can make the pancake from the mixture in two different ways, 1. either using your hand (follow step-6 & step-7) or 2. directly put mixture in a pan and give shape using a spoon (follow step-8). 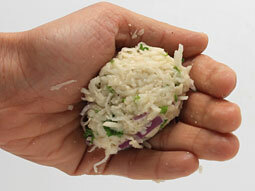 Take one portion in your hand and press it between your palm and fingers. Flatten it a little to give pattie like shape. Don’t worry if it is not perfectly round shaped. If you want to make the pancakes directly in a pan – when oil is medium hot but not smoking, place one portion (little less than 1/4 cup) of mixture in a pan and press with spatula to make 1/2-inch thick pancake. If you have made pancake using hand – when oil is medium hot, place 2-3 pancakes gently in a pan. After 2-3 minutes, you will notice the edges of bottom surface starts to turn golden brown (as shown in the photo). When this happens, turn it upside down. It will take around 2-3 minutes to turn golden brown on one side. Shallow fry until golden brown on other side, approx. 2 minutes. 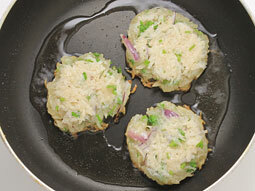 Remove it from skillet and place on paper towels to absorb excess oil. Prepare pancakes from remaining mixture. 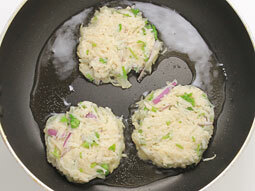 When making the next batch, add more oil in a pan if required. 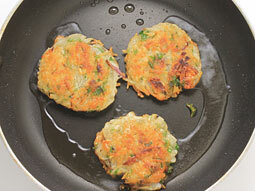 Serve crispy potato pancakes with cheese dip. If you are using medium or large size skillet, you can fry 2-3 pancakes at a time according to its size. 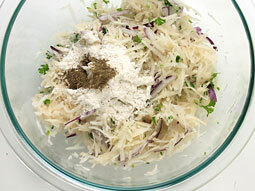 If required, add additional 1 tablespoon flour to bind the potato-onion-flour mixture in step-5. 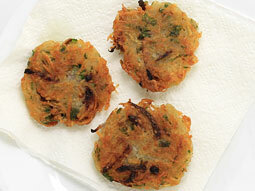 Taste: Mild Spicy, with soft and mellow crust between crispy outsides. 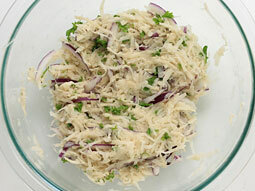 Serving Ideas: Serve it hot with sour cream and chopped spring onion. I luv this, need to see more of this. Just tried it, it came out super. Loved it. It is very easy and quick to make. Thanks for sharing. Parsley ko kisse replace kia ja sakta he? Response: Hi Pragati, you can replace parsley with cilantro (coriander leaves / hara dhaniya). Thank u soo much....Really awesome....useful to food lovers..